Gilhooly's Bride - white stoneware with various glazes, 3 1/2" dia. 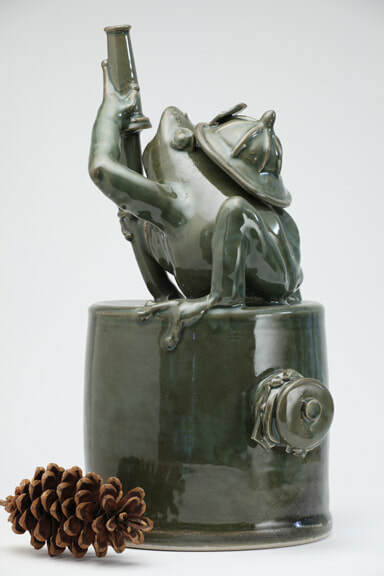 fountain head with firefrog and hamburger - iron green glaze on white stoneware, 18" h.
Candle holder with frog handle - celadon on white stoneware - 4" h.
Star Pottery mark. 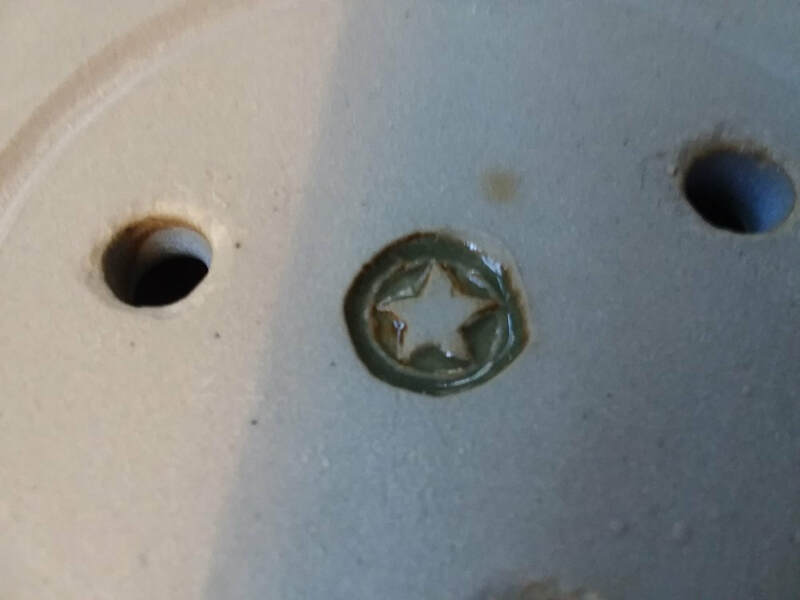 This stamp appears on the bottom of most of these pieces. This work is fine art masquerading as tableware. 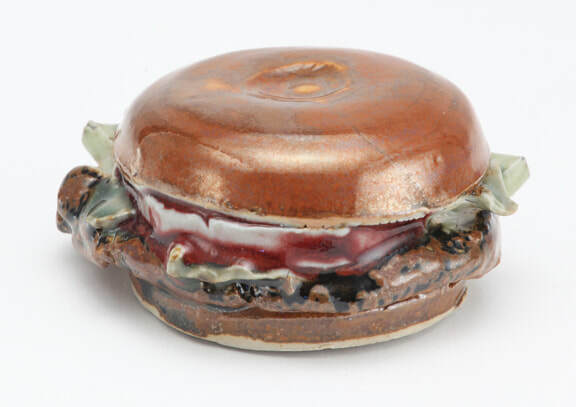 The material is high-fired stoneware and porcelain. It is food-safe and can go in an oven, dishwasher and microwave. 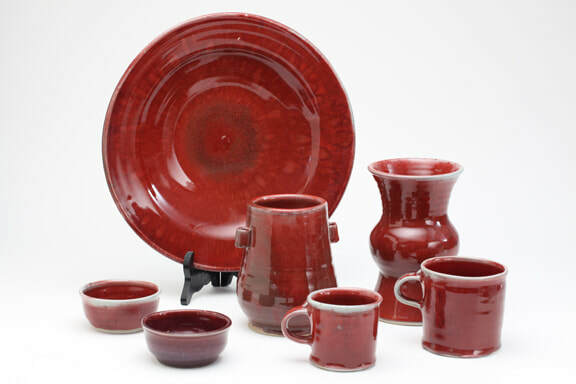 However, the purpose is not so much to fill a niche in the tableware market as to use the challenges of tableware forms as a format for the work. It can be used at the table but it will not compete with Wedgewood or Franciscan Desert Rose wares. 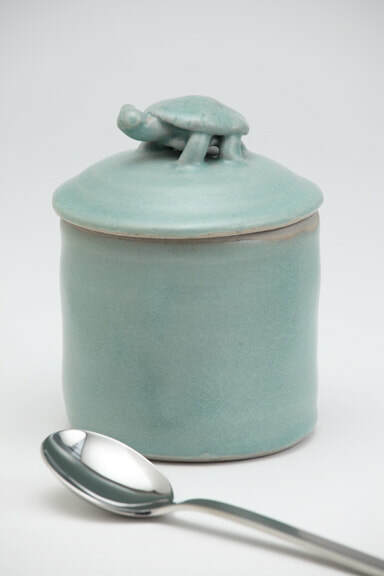 Classic celadon glaze was developed in China beginning about the time of Christ. It has been found in tombs from about that time. 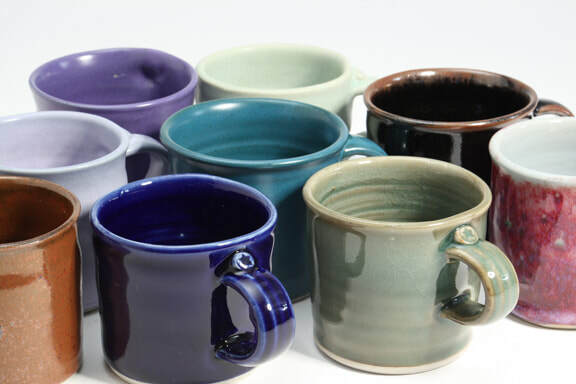 The term is used for a range of glazes, usually transparent or translucent and light green. 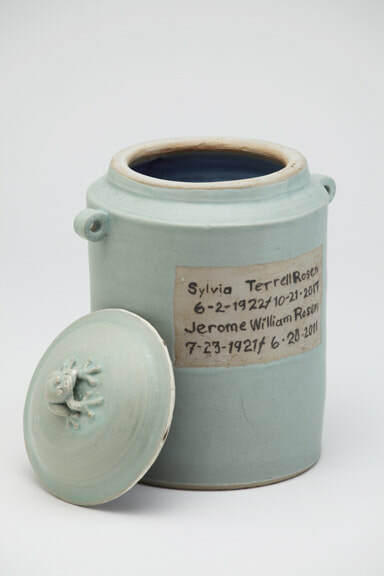 True celadon is a high-temperature glaze fired in a reducing atmosphere, colored with a small amount of iron. 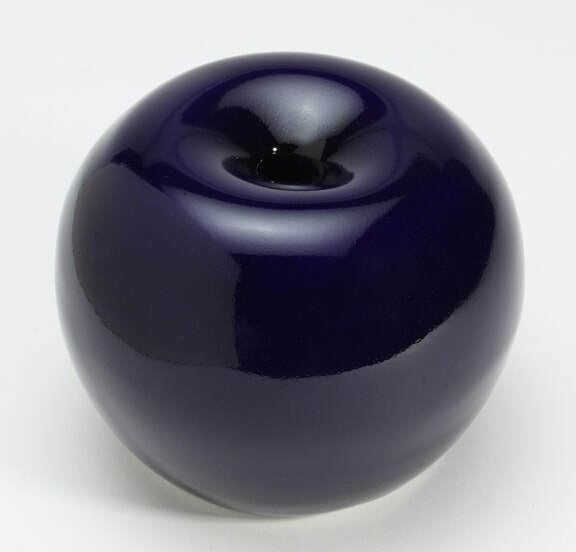 The quality of this glaze reached its zenith during the Song Dynasty (960 - 1279 A. D.). It was highly prized in the imperial courts. 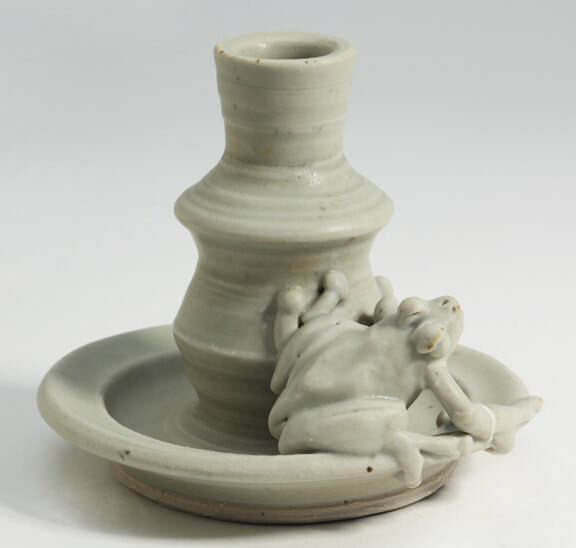 The celadon of the Song Dynasty has a light jade green color. It is applied thickly over the clay, but remains translucent. It has a surface similar to unpolished jade, a surface which has been called buttery. 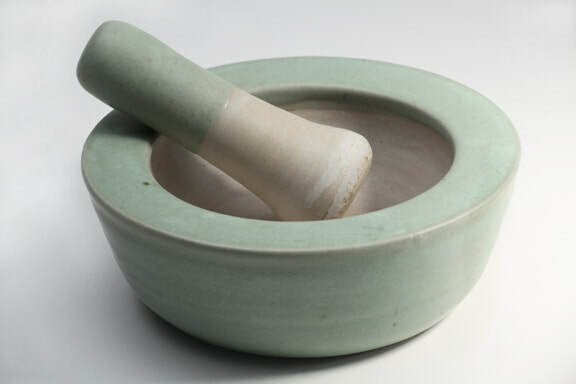 Since the Song Dynasty celadon has been produced all around the world. Some of this is quite well made and esteemed, but it is almost all shiny. The range of compositions which produce a shiny celadon is enormous. A jade-like surface is only possible with some very narrow ranges of composition. My celadon glaze is the Song Dynasty variety. 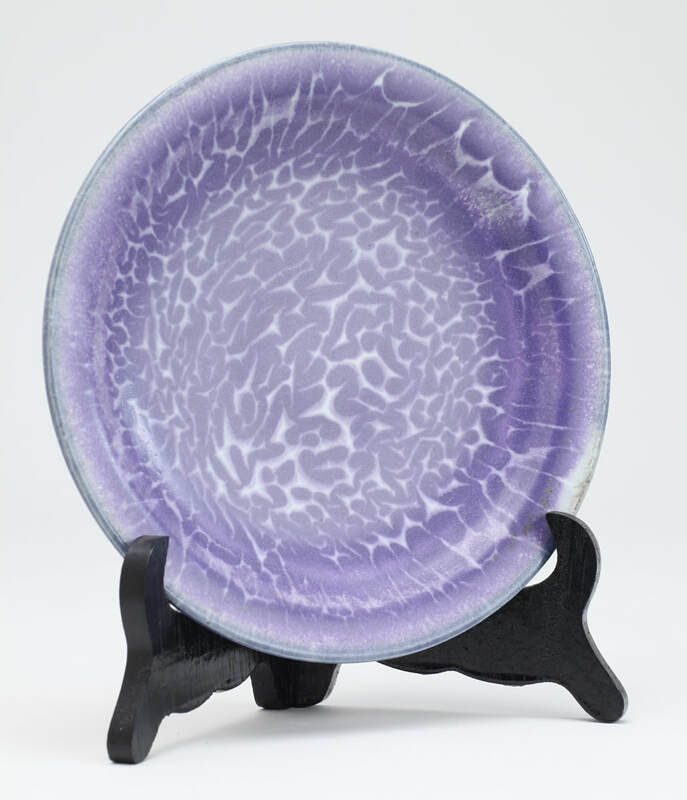 The quiet beauty of this glaze belies its pale color.